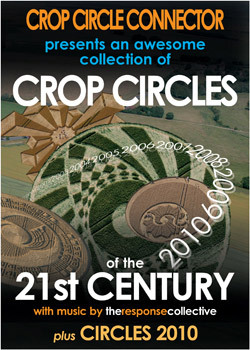 CROP CIRCLE CONNECTOR is proud to present this superb collection of memorable circles on one unique double bill DVD filmed by Stuart Dike and Julian Gibsone and co-ordinated by Mark Fussell. Directed and edited by Julian Gibsone. Cover Design by Beverley Gibsone. This is an awesome collection of some of the most significant formations to occur this century. We take you on a remarkable odyssey where you can see the relationships and meanings between the formations over these years. A combination of wonderful aerial and ground pole video photography makes this an illuminating experience. We group circles together that appear to have related design features and meanings. Presentation ‘lives’ at our Alton Barnes Event. This DVD is a ground breaking and wonderful experience. An in depth survey and exploration of the 2010 SEASON. We bring you revealing aerial photography and intriguing ground pole shots that highlight the details within the formations. We experience the wonder of the formations as they appeared in the fields of England from May till August. Through his engaging narration STUART DIKE shares his thoughts and views on the 2010 season. An inspiring production. Mark Fussell, Webmaster of Crop Circle Connector, coordinated and co-produced these complex projects. There is wonderful aerial and ground camerawork by Julian Gibsone and Stuart Dike. Julian Gibsone directed these captivating videos and edited them. Julian has also written, shot, edited and directed 'Crop Circles - The Ultimate Undercover Investigation' which is distributed by Crop Circle Connector. This DVD incorporates the wonder of geometry with the amazing imagery of the crop circles within their landscape. The power and presence of these incredible events can not be under estimated, as we provide our own vision of this phenomenon. This is our 9th production on this ever expanding phenomenon; it will complement the DVDs from previous years, as we delve deeper into the mysteries of their meaning, and their placement within the landscape. please use PAYPAL OR CREDIT CARDS. The purchase price for this service is USD $25 (£15.00) which includes Post and packaging. The DVD-R disk is compatible with most domestic consumer DVD Players and Computer based DVD-R ROMS, check this link. Before buying. Enter your DVD model and click the DVD-R Box to see compatibility.